Where oh where has the blogger been? She was going along strong and posting consistently. And then BAM she disappears out of nowhere. What. is. up.? Well, what is up is a great big pause in our culinary questing in order to diet. That combined with longer, busier work days, and more happening outside of work as well. All good things, but as these life tends to go, when some things increase, others must decrease. Alas, that has meant neglect of the blog. But. I am excited to share a bit about this diet we started 3 weeks ago. Neither my husband nor I have ever dieted. We have both always been very physically active and as a result haven't had to pay quite so close attention to our food intake. But the year of 2013 was filled with much travel, celebration, dessert baking, and little exercise. All of this amounted to both of us ending 2013 at our heaviest weight ever and each desiring to lose about 15 pounds. In 2014 as we settled into married life, grad school/work, and our new home State, we made an effort to eat healthier and be more physically active. And while we weren't gaining any weight, we also weren't LOSING those extra 15 pounds. As such, we decided we needed to go on a more structured diet. And so the search for a diet began. We didn't just want to choose something that was popular at the moment without knowing the underlying rationale for, or evidence behind the diet, nor did we want to choose something that was unsustainable. So. 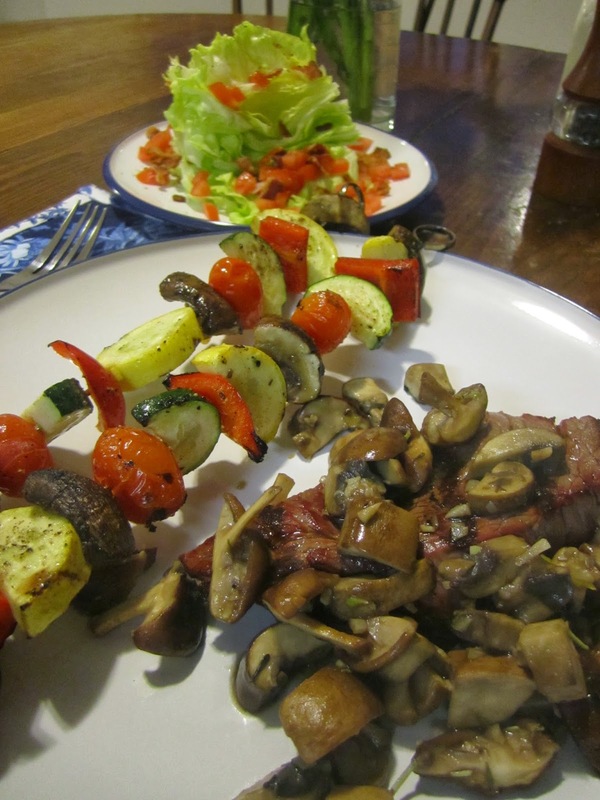 After much reading and searching on the part of my sweet husband, we decided on the DASH Diet. This diet has consistently been ranked as the Best and Healthiest Diet plan, so that's a plus. And there is lots of great evidence backing it up. Also a plus. DASH stands for Dietary Approaches to Stop Hypertension. So, this diet was designed specifically for people with high blood pressure, and (if you find this kind of things important) there are randomized controlled trials supporting this diet in that realm. And it just so happens that eating in such a way as to lower your blood pressure also helps shrink your waistline. Win, win! There is a really clear and easy-to-read book that goes through all the specifics of the DASH diet and has loads of helpful meal plans and recipes. But here's the basic idea- Phase 1 of the diet is a 2-week intensive phase where you reset your metabolism and get your blood sugar at a stable level, and then Phase 2 is a maintenance phase "to infinity and beyond" where you add back a number of foods that were off limits in Phase ,1 and maintain certain eating and lifestyle patterns to continue to lose and/or maintain your weight (and blood sugar and all that goodness). Right, so Phase 1 as a "reset" phase pretty much means no sugar or grains. And let me just tell you- it's really hard, because it amounts to detoxing from the wonderfully addictive drug of sugar. But let me also just tell you, it's so very very good and stabilizing. You can have unlimited (nonstarchy) vegetables in Phase 1, moderate amounts of lean protein, and moderate amounts of light dairy and nuts. But you cannot have fruit, starchy vegetables, or any type of grain (i.e., potatoes, corn, rice, pasta, bread, barley, quinoa- none of that). Interestingly, you can have practically unlimited amounts of sugar-free Jello, which they suggest you eat after lunch and dinner to in some ways satisfy the craving for fruit and sweets. The point is not to count calories but to stay within ranges (depending on your size and appetite) of certain types of foods (vegetables, proteins, dairy). The big thing they say is to focus on what you CAN eat rather than what you CANNOT eat, and focus on taking it one day at a time and remembering it's only two weeks. Quite frankly, the other thing I focused on was the fact that I was losing weight like crazy. Something like 7 pounds in the first two weeks. I was tired and cranky and detoxing like a true sugar addict, but I was eating healthy and losing weight, dagonit. And let me just say, we ate some pretty great meals in Phase 1. I took some pictures of them just to share some of the goodness. I linked to any recipes I got online. As you see, this isn't one of those diets where you have to eat terrible foods all the time. We tried to think of it as a another type of culinary adventure, and worked to make really interesting and fun dishes within the boundaries of the diet. They are very clear that you need to eat all three meals and a snack in between each, so you aren't feeling hungry all the time. There are helpful guidelines for snacks too, which for us most often amounted to lots of light string cheese, hummus and vegetables, kale chips, and raw almonds. Interestingly though, in Phase 1 where you have virtually no sugar, despite eating very healthy foods, you feel tired and icky because your body is getting rid of so much accumulated gunk. Alas. Interestingly, this also effectively amounts to a Gluten-Free diet, so for those who need to or choose to go GF, the DASH Diet has great recipe options. I will say, this phase was considerably more expensive in terms of our grocery bill than our normal eating habits. We did not eat out during this phase, so that accounts for some of the excess grocery bill. But, to be honest, it's just more expensive to NOT eat processed foods and to eat primarily vegetables and lean proteins. We've now been in Phase 2 for a little over a week, we feel great, and I've lost another 2 pounds. I don't constantly crave sugar or junk food. In fact, I actually crave healthy foods, and I get a stomachache even if I eat more than modest amounts of rice, pasta, or bread. Apples and bananas taste incredibly sweet (and satisfying!) to me. I get full faster. I have more restraint and self-control with food. I have more energy. So, yes, I've lost some weight, and yes I hope to lose a bit more, but more than that, I've "reset" to healthier habits overall. And that's a win. If you want more information on the DASH diet, the Mayo Clinic website has a good overview, as does this Chewfo page that clearly outlines what foods you can and cannot have in the two phases, as well as quantities and portions. Oh, and I do have a few Italian recipes in my Draft Post folder that we ate prior to The Diet but I did not have a chance to write about. I'll hopefully post those in the coming weeks. I thought I was choosing a simple recipe. I thought it was going to be a quick Monday-night-after-work prep. I bought the ingredients in advance, except there was no broccoli rabe where we usually shop. So I intended to stop at another place on Monday on my way home to get broccoli rabe. Except that when I went there, I managed to purchase 6 other things and forgot the broccoli rabe. So my sweet husband kindly agreed to go back to purchase it after he got home from a long day at school. Except they actually didn't have broccoli rabe there either, so we ended up with broccoli. Which is fine, but it doesn't so much cook like broccoli rabe. So my timing and logistics were all conflustered. And then there was the orecchiette disaster. You can read more about that below. Suffice it to say, this recipe did not go well for us. However, I still think it's a rather simple recipe, and should you actually have broccoli rabe and know how to not fail at cooking orecchiette, you should assuredly be fine. And I will say, despite all the issues, in the end our meal tasted alright, it just wasn't so much the most wonderful process. So. Orecchiette with Sausage from The World Kitchen. In a frying pan over medium-low heat, warm the tbsp olive oil. Add the bread crumbs and stir to coat them with the oil. Season lightly with salt and cook, stirring often, until the crumbs are an even, deep golden brown, about 10 minutes. Pour onto a plate and set aside to cool. Bring a large pot three-fourths full of salted water to a rolling boil. Add the broccoli rabe and cook, testing often, until the stems are just tender, 2-3 minutes. Using tongs or a wire-mesh skimmer, lift out the broccoli rabe into a sieve and cool it quickly under running cold water. Drain and squeeze gently to remove excess moisture. Chop coarsely and set aside. Add the orecchiette to the boiling water and cook, stirring occasionally, until al dente, according to the package directions. Meanwhile, warm the 1/3 cup olive oil in the frying pan over medium-low heat. Add the sausage, garlic, and red pepper flakes and cook, stirring and breaking up the sausage meat with a wooden spoon, until the sausage is browned, about 7 minutes. Add the broccoli rabe and stir to combine with the sausage. Cook until the broccoli rabe is heated through, about 2 minutes. Season to taste with salt. When the orecchiette is ready, scoop out and reserve about 2 ladlefuls of the cooking water, then drain the pasta and return it to the pot. Add the sausage mixture and the cheese to the pot and stir over low heat to combine, adjusting the consistency with some of the cooking water if needed. Divide among warmed plates, top eat portion with a sprinkle of toasted bread crumbs, and serve at once. Pass the remaining crumbs at the table. As I said, we weren't able to acquire broccoli rabe. And our timing was kind of funny, so I just ended up cooking the broccoli in a separate pan with a bit of oil, rather than boiling it and then adding it to the sausage. That worked well enough, but just be careful not to let it burn. I used a ground mild italian sausage, not in casings, and that worked well. What happened with the orecchiette is that all the shells got stacked and stuck together, so they didn't cook properly. Some were solo shells, some were group 2, 6, or 12 high. Womp womp. Now. Despite stirring the pasta soon after pouring it in the boiling water, I think we did not have a large enough pot for the quantity of pasta, so it did not have much space to separate. By the time I realized the problem, it was too late. We tried to stir, we tried to use tongs to pull the big clumps apart, but to no avail. When we poured it out in the colander, we thought there were enough properly cooked solo shells, so we literally stood at the sink digging through the hot pasta and pulling out single shells. It was quite comical, really. At least we could chuckle about it together. In short, if you make this, I would suggest using a large pot and be sure to stir it quite a bit when you pour in the orecchiette. Or just use some other kind of pasta. Which is what we did the second night. This made about 5 servings. If you make this as directed, let us know how it turns out! What is more simple, delicious, and comforting than spaghetti carbonara on a rainy (or snowy- pick your poison) winter evening? I looked at a number of spaghetti carbonara recipes for this, because every book in which we have Italian recipes has spaghetti carbonara. Well. They're all pretty much the same. With a recipe this simple, there is little variation to be had. The real differences are whether you use bacon vs. pancetta, Parmesan vs. Romano, and whether or not you add an extra egg yolk. Now, some may argue those differences are significant, but in the grand scheme of things, I think not. Though I started with the recipe from The World Kitchen, in the middle of making it I remembered Ruth Reichl's book Garlic and Sapphires: The Secret Life of a Critic in Disguise (a memoir, with some recipes). And I remembered she had a spaghetti carbonara recipe. And I thought it might have included garlic. And obviously garlic is a necessity. However, many carbonara recipes - including that in The World Kitchen - do not include garlic. But I repeat- garlic is a necessity. In Italian cooking. In life in general. We may or may not use an entire head of garlic a week. At least. So. Use Ruth's recipe. And read that book, it's pretty hilarious. Contrary to the recipe so often used in restaurants, real carbonara contains no cream. The real thing also uses guanciale, cured pork jowl, but to be honest, I like bacon better. I think of this as bacon and eggs with pasta instead of toast. It's the perfect last minute dinner, and I've yet to meet a child who doesn't like it. Bring a large pot of salted water to boil. When it is boiling, throw the spaghetti in. Most dried spaghetti takes 9 to 10 minutes to cook,and you can make the sauce in that time. Cut the bacon crosswise into pieces about 1/2 inch wide. Put them in a skillet and cook for 2 minutes, until fat begins to render. Add the whole cloves of garlic and cook another 5 minutes, until the edges of the bacon just begin to get crisp. Do not overcook; if they get too crisp they won't meld with the pasta. Meanwhile, break the eggs into the bowl you will serve the pasta in, and beat them with a fork. Add some grindings of pepper. Remove the garlic from the bacon pan. If it looks like too much to you, discard some, but you're going to toss the bacon with most of its fat into the pasta. When it is cooked, drain the pasta and immediately throw it into the beaten eggs. Mix thoroughly. The heat of the spaghetti will cook the eggs and turn them into a sauce. Add the bacon with its fat, toss again, add cheese and serve. We used pancetta instead of bacon, only because we had a few ounces left over from an earlier recipe. It was perfectly tasty, though I think bacon would be equally as delicious. And perhaps the next time we have a little extra bacon (but I mean, when is there EVER leftover bacon?? ), we'll use that. This is so very simple, and so very delicious. I think we made it in under 15 minutes. And it will warm your tummy and your spirit. This is one delinquent blogger. First of all, I didn't take any pictures of this soup. And then there's the issue of posting about a not-so-romantic dish on Valentine's Day. Here we are doing this Italian culinary quest! So romantic, right? I mean, here's all the evidence you need of Italian food being romantic. And on this fine fourteen of February, I give you barley. mountain. soup. I'm never going to make it in this blogging world. But. In my defense. The original plan was to post the pesto recipe today and the soup earlier this week. And then life happened. As it seems to more and more often. So today you get barley mountain soup. Though, given the constant gray and rain in the Pacific Northwest and the near constant snow piling up on the East coast, this may make for a romantic snowed-or-rained-in Valentine's Date. So. There we have it. And now, Barley Mountain Soup from The Italian Country Table by Kasper. Finely chop the onions, carrots, parsley, and garlic. Combine the barley, potatoes, and meat in a 6- to 8-quart pot. Add half the onion mixture to the pot with 2 branches of the rosemary. Add the buttermilk if desired. Then add 4 quarts water. Simmer 50 minutes or until the barley is almost tender. Meanwhile, heat the oil in a 12-inch skillet over medium-high heat. Saute the rest of the chopped vegetables to a golden brown. Add to the pot and season with salt and pepper. Simmer another 30 to 40 minutes. Remove the meat and bones. Break up meat into small pieces and return them to the pot, along with more water if the soup is as dense as stew. It should be a thick but soupy soup. Strip the leaves from the remaining 1 branch of rosemary and mince. Stir into the pot and simmer another 10 minutes. Adjust the seasonings to taste. Serve hot. You guys, I really know nothing about buying ham shanks or hocks. And the only thing I know about prosciutto is those delicious and delicate slices of salty meaty glory. And so (unsurprisingly) when I went to our beloved WinCo to buy the called-for shanks/hocks, I was terribly confused what to buy. Especially because I only needed 1/2 pound. And all the ham shanks were 5 pounds. No bueno. And hocks were nowhere to be found. And my wonderfully helpful husband was not on this particular grocery run with me to adroitly navigate uncharted territories. *sigh* So what did I do, you may ask? I bought a tube of pork sausage, like a good American. Now, I completely understand that this probably changed the very essence of the recipe, but alas. It is what I used. And the soup was pretty darn tasty. I do take comfort from the introduction of the recipe, which states, "Through the winter the people of northern Italy's Trentino region rely on this soup, made with barley grown in their fields and meats the cure themselves- sometimes it is a meat shank of ham, sometimes sausage, and sometimes speck, smoked and air-dried leg of of pork." I was unclear about the rosemary. I thought that I was supposed to take the leaves off the 2 branches you add early on, because it never said to take them out at the end. But in retrospect, I think the intention is to put the whole branches in for flavor while the soup cooks and then remove them at the end, but then also add the minced rosemary at the end. The large leaves were a bit too much. So it goes. I used buttermilk, but I did not use a quart, as I wanted some semblance of healthiness in this soup. I probably used two cups. It did, as Kasper states in the intro, add a wonderful tanginess. I made 1.5 times this recipe and it made about 8 hearty servings. And this did not take near as much time or effort as the minestrone! May I suggest you listen to this playlist as you prepare this romantic Valentine's Day soup? Isn't pesto one of the most splendid sauces? And fresh pesto! Mmm! It makes me salivate just thinking about it. 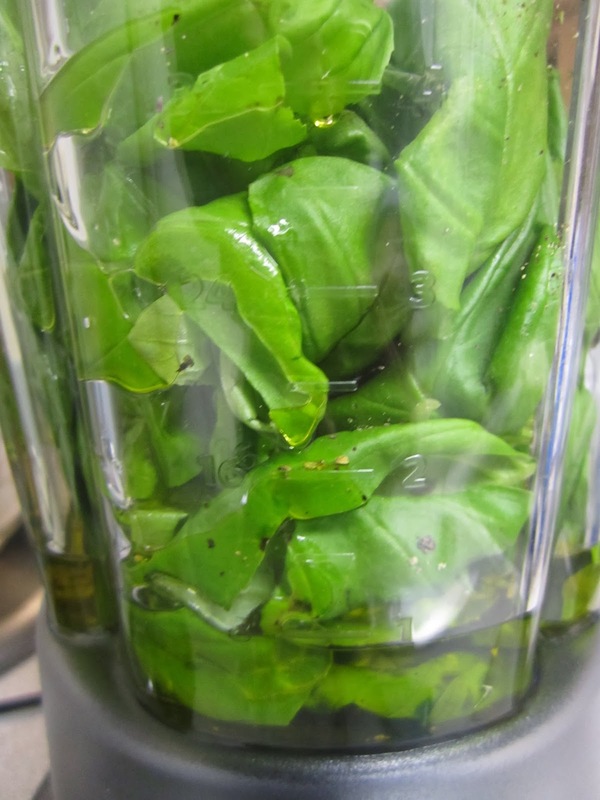 Since we got ourselves a real basil plant and have managed to keep it alive, we had the core ingredient for making some pesto. But then there was the issue of pine nuts. Now, for those of you who haven't been reading for 4 years, or for those who don't remember every single one of the 750+ posts I've written, I will direct you back to 2010 when I learned about pine mouth. Which amounts to me having an allergy of pine nuts that results in all food tasting like metal for about a week after eating pine nuts. Truth be told, I love pine nuts, but I have not eaten them since that incident. However, diving into the pesto realm, I thought I would give it a go, but only if we could find Italian pine nuts, rather than Chinese pine nuts, which are ostensibly the culprit of the allergy. Thus began our quest for Italian pine nuts. We usually shop at a wonderful place call WinCo, and they have a crazy expansive bulk food section that is crazy inexpensive. Literally hundreds of items you can buy in bulk. So of course they had pine nuts, and they were not terribly expensive. However, they did not have any label indicating from whence they had cometh. I even downloaded a QR Reader app so that I could scan the code in order to find out more info. No luck. I even asked a WinCo bulk food worker if he knew where they were from. He looked at me like I was crazy. Maybe so. Onward to Fred Meyer. They also had pine nuts in their (smaller) bulk foods section. But they were $38 per pound. And on principle I am simply not going to even get a quarter pound of that craziness. A kind employee directed us to some packaged pine nuts, but they were also expensive ($17 for an 8 ounce bag). And from China. Cue frustrated sad music. So my sweet husband - a man who is infinitely flexible and adaptable in the planning and execution of recipes, and who I think shines and thrives even MORE when there are road bumps along the way to a delicious dish - said we would just have to find a pesto recipe without pine nuts, and we would make it the bestest pine-nut-less pesto ever. He might not have said it precisely like that. But pretty close. 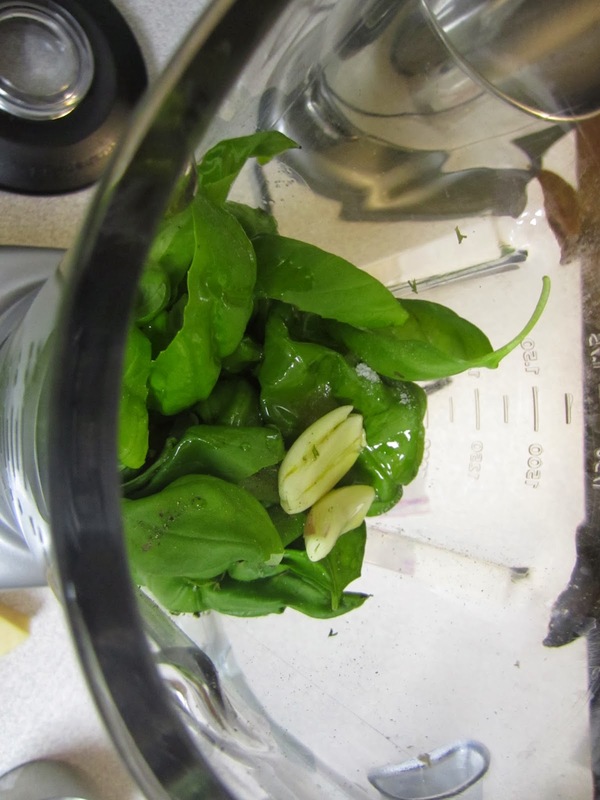 Combine basil, parsley, salt, pepper, garlic, and oil in blender. Blend just a few seconds. Stop blender and push herbs down with a rubber spatula. Blend a few seconds, then sto again to push herbs down. Repeat this procedure until sauce is fairly thin, but not liquefied. Transfer sauce to a bowl and add cheese and reserve. This is a pretty simple and straightforward sauce that is absolutely fresh and delicious. Even without pine nuts! We did not have fresh parsley, so we just used about a half teaspoon of dried parsley. We also only had Romano on hand, so we used that instead of Parmesan. This amount made enough pesto to go on 8 servings of our potato gnocchi. I think that the addition of pine nuts would help thicken the pesto a bit, but we did not think it was lacking without them. We also talked to someone who has substituted almonds for pine nuts, with good results. My husband was right, it was pretty much the bestest.